[Because of Covanta Contract] "...we're also not promoting recycling in a big way right now." - Waste Boss Daryl Smith, Lake County, Florida. Dec 2009. Lake County, Florida, United States. Dec 27, 2009: Because of the feared shortage of local waste and its economic impact on Lake County, the county is desperately trying to import waste to feed its Covanta-incinerator. The contract has already cost Lake County taxpayers about $300 million more than they bargained for. Lawsuits have already lasted 20 years. 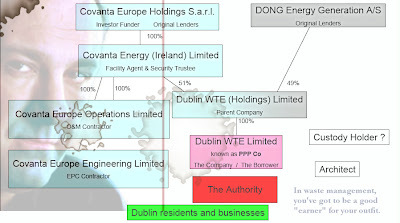 As they are not stupid why did Dublin City Council choose Covanta? The Florida contract seems to be similar to Dublin Corporation's secret put-or-pay contract. 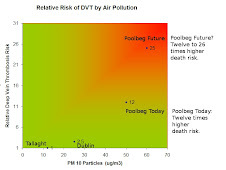 Dublin's contract is likely to cost taxpayers €450 million over 25 years, in addition to the other costs (guess: €300 million) and also kill many recycling efforts. Covanta just hired a new lawyer in the UK, recycled from a competitor. Surely they don't need new talent to help the talent at DCC? The DCC City Manager can extort the taxpayer all by himself by spinning: build the Covanta white-elephant or pay up an extra €450 million. DCC has already spent €50 million on lawyers and other expert professional (details withheld by DCC). DCC is curiously paying top-dollar for the incinerator site: €70 million, or €5 million an acre. Who benefits there? Caution: These facts have not been massaged much by Reliable Publishers of Spin NV (RPS). RPS NV is not related to similarly named government contractors. RPS NV stands over this statement. Lake County Florida is on the lookout for trash. County commissioners have authorized solid-waste boss Daryl Smith to seek out fresh sources of garbage to feed Covanta Energy's incinerator, including trash from Orange and Marion counties. The county's hunt for trash is essentially a hunt for cash. Because of a complicated deal between Lake County and Covanta, the county is contractually obligated to bring 163,000 tons of trash a year to the waste-to-energy facility in Okahumpka — that's about 3,135 tons a week. The county earns about $580,000 a month from Progress Energy for electricity produced by the incinerator as long as the county provides adequate monthly "fuel" for the facility's trash-burning operation. But solid-waste collections have tumbled because of the region's economic malaise. "Garbage is a great indicator of the economy," Interim County Manager Sandy Minkoff said. "As the economy falters, garbage collections fall. People don't produce as much garbage because they're not buying as much." Landfill operators across the nation have reported sharply lower collections. In a presentation to commissioners this month, Smith said solid-waste statistics show a "disturbing trend" that could potentially cost the county millions of dollars unless it finds new waste sources. Smith used trash-collection figures compiled from Sept. 7 through Nov. 14 and projected the statistics over a 12-month period. The county could fall as much as 15,000 tons shy of its delivery guarantee. "We're looking all around to find what waste we can," Smith said. "We're committed to succeeding because of the financial impact if we fail … not doing this will be very, very costly because of the [energy] revenue we get." During the past year, county officials won commitments from Eustis, Fruitland Park, Lady Lake and Mount Dora to permit their solid-waste hauler, Waste Management, to deliver collections to the county. That helped, said Smith, director of environmental utilities. Clermont, Leesburg and Tavares also send their waste to the county. Even so, Lake County barely met its contractual obligation to Covanta for fiscal year 2008-09. Smith said the county surpassed the 163,000-ton mark Sept. 29, the day before the fiscal year ended. Covanta's facility, which operates 24 hours a day, seven days a week, burns as much as 528 tons of garbage a day, much of it delivered by haulers who ferry trash from Lake homes, offices, restaurants and businesses. The county's contract with Covanta expires in 2014. The facility, which began burning trash in August 1990, produces about 95,000 megawatts of electricity a year, enough to power about 5,500 homes annually. Covanta's chairman, Sam Zell, also heads Tribune Co., publisher of the Orlando Sentinel. Winter months usually boost trash collection in Central Florida. "Not because of the holidays and Christmas wrappings," Smith said. "The bump we generally see is attributable more to [snowbirds] returning from up North. More people generally translates into more solid waste." But snowbird trash is unlikely to be enough for Lake County to meet its monthly garbage obligation. Because of the feared shortage of local garbage and its economic impact on Lake, county officials have begun to pursue solid waste beyond its borders. Smith informed commissioners that Marion County is faced with shrinking landfill capacity and has investigated options for its refuse — including incineration — as a means to preserve its remaining landfill space. He noted in his report that "it could be in the best interests of both counties to establish a limited pilot [solid-waste] delivery program" and set the groundwork for regional waste-management solutions in the future. Lake does not intend to end its recycling program, which diverts trash from the incinerator. "We don't want to turn off what we've turned on," Smith said. "But we're also not promoting recycling in a big way right now." Lake has chafed under its original agreement with Covanta for more than a decade. 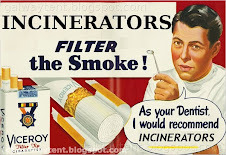 Article: Lake County, Fla., Arrives at Incinerator Deal. Oct. 29--TAVARES, Fla.--Lake County leaders at the close of a 13-hour meeting Tuesday voted with relief to approve a new contract that is expected to save taxpayers more than $20 million on the county's garbage-burning incinerator. "Now we just hold our breath," said Commission Chairman Welton Cadwell, who called the settlement "an imperfect solution." The vote marks the end of more than two years of negotiations by the county and the company, Covanta Energy. Dublin City Council is to pay €70 million for the site for its controversial incinerator in Poolbeg when the deal is completed later this year. The council is in arbitration with a number of parties over a compulsory purchase order for the 13.6-acre site in Dublin, but the eventual figure will be of the order of €70 million - or more than €5 million an acre - according to a council spokesman. Some €120 million has been spent on the incinerator project to date. A detailed breakdown of the figures is not available, but the council said that the remaining €50 million was spent on by consultancy costs, legal bills, securing planning permission, environmental approval and other development costs. The cost of the Poolbeg incinerator is running at many times the cost of a private incinerator being built in Co Meath. Indaver, which is building the Meath incinerator, said it had spent €6.5 million so far on that project, which included the purchase of the site and development costs. The Indaver incinerator will have a 200,000 tonne capacity, which is smaller than the Poolbeg project, which has capacity for 600,000 tonnes annually. The Poolbeg project has been criticised by several groups, including John Gormley, the Green Party leader and Minister for the Environment, as being too large. Meanwhile, The Sunday Business Post understands Dublin City Council will lose millions of euro in income under a revenue share agreement for the incinerator, if it cannot supply up to 320,000 tonnes of waste a year. The figure is in addition to penalties the council has already said it could pay to the incinerator operator. Link to Orlando Sentinel is broken. Title does not show in google. A Mr Zell is chairman of Covanta, and owned $666 million of CVA stock in 2009. Mr Zell owns/owned large part of Tribune Company, which includes Orlando Sentinel. Zell bought Tribune Company after selling property empire for $20 Billion to $30 Billion circa 2007. Tribune Company has entered bankruptcy proceedings. Covanta has emerged from bankruptcy.